Live in the Limo photo: Christine Licata. On the last day of this year’s Armory Show, a friend and I made our way out to 12th avenue and climbed into the back of a limo. Joining us were several other people, a host from Art International Radio, a woman playing a toy piano, a man playing a violin, a composer, several bottles of champagne, and the co-curator of the event, Sonya Hofer. We took off down the West Side Highway as the composer handed out postcards displaying various abstract ink drawings. “Art!” offered somebody, another preferred love, still another made a case for music. A discussion ensued as the limo turned left and the violinist began to make little barking noises. “And the worst thing?” the host piqued, pouring another round; hate, abuse, disappointing someone, and getting up in the morning, came the replies. The violinist was really yelping now, and the woman at the piano looked pleadingly at the passengers. “I suggest,” said the composer, an elegant man in shoulder length hair, small glasses and a stylishly rumpled suit, “that you hand them another card.” A general dawning spread throughout the cabin and several cards were quickly thrust forward. A star pattern prompted a shift to a sprinkling etude as the violinist indicted his gratitude. 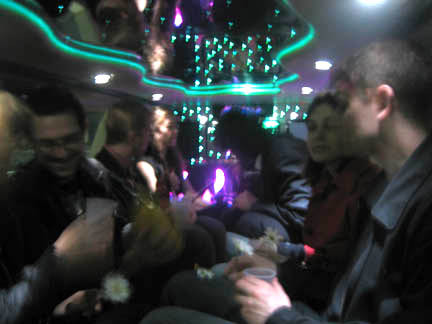 The limo was somewhat cramped, as such vehicles always are, but a third round of champagne seemed to affect a general loosening: a husband sitting across from us confessed his wedding day to have been the best of his life. His wife, sitting next to him, spoke subsequently but chose differently, “Sorry, darling,” she said, to laughter. Some twenty minutes and three bottles later we were all of us back on the pier, somewhat tipsy, tilting our separate ways. A passenger pumped Hofer’s hand, “Wonderful, just wonderful” she beamed, before skipping back inside towards the fair.